With the movie Solo: A Star Wars Story in theaters now what better time for my profile of the Han Solo of the 1930s. Female author C.L. 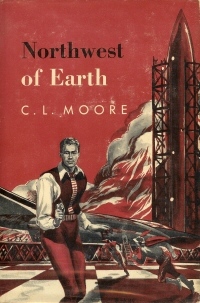 Moore wrote a series of pulp adventures about her often neglected science fiction figure Northwest Smith. THE MOON MAN – Created by Frederick C Davis, the Moon Man is, to me, the epitome of the campy but fascinating heroes the old 1930s pulp publications used to treat readers to, issue after issue. Operating in fictional Great City, the Moon Man not only waged war on the ruthless representatives of the criminal element, he also plundered their ill-gotten wealth from them and distributed it to the Great Depression-ravaged poor of the 1930s. This not only made the hero a combination of the best elements of the Shadow and Robin Hood, but it also gave him a healthy dose of “Green Hornet appeal”, too, because, like the Hornet, the Moon Man was hunted by both the crooks AND the cops, doubling the danger for the daring and resourceful figure every time he donned his costume and stalked the night-darkened streets. That costume, by the way, is beloved by some fans for its hammy, campy, “pulpish” quality, but is just barely tolerated by others for the same reason. 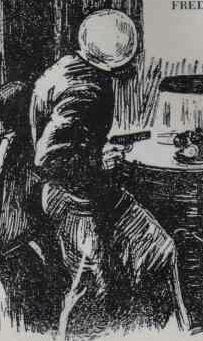 The Moon Man was armed with an automatic and dressed all in black, usually including a black cloak, and hid his face behind a round glass globe that covered his entire head. TIME PERIOD: Pre-World War One Era on up through the start of the Great Depression with an epilogue set during World War Two. This was Robert Ludlum’s very first novel and it’s a shame that the planned movie starring Ingrid Bergman never panned out. In my opinion there has never been a very good screen adaptation of a Ludlum novel. Or at least not when it comes to adaptations that are actually like their source material. The successful Jason Bourne movies bear virtually no resemblance to the trilogy of novels that inspired them. Other films or mini-series’ adapted from Ludlum’s writings have tended to be so far off the mark that some of them qualify as classically bad, for instance The Osterman Weekend. HEROINE: (This novel has a female and a male protagonist) Elizabeth Wyckham Scarlatti, an 1890s adventuress from American Old Money who – in her youth – spurned plenty of bloated rich pigs for not being as high-spirited and daring as she was. Her heart and loins are finally stolen away by Italian-American Giovanni Scarlatti, a laborer in her father’s factory. Though he speaks broken English, Scarlatti’s mechanical genius is first-rate. The rebellious Elizabeth combines her own business acumen with Giovanni’s aptitude for inventions and before long the two lovers are married and have taken over the companies run by her father and plenty of his friends. The Scarlattis continue to thrive financially through the expected hardball methods and after having three children they change the family name to Scarlett. Eventually Giovanni dies of natural causes and eldest son Roland is killed during World War One. Making her own version of Sophie’s Choice, Elizabeth allows her brawling, bullying wastrel of a son Ulster to enlist in the Army to romantically take Roland’s place in the World War while keeping third son Chancellor in America with her to prep him to take over Scarlett Industries when she dies. THE MAN WHO COULD LIVE UNDERWATER (1908) In the story which introduced the Nyctalope he was a supporting character to one of Jean de la Hire’s other fictional figures, in this case Charles Severac. That man invented and captained the Torpedo, a super-scientific submarine that would make Captain Nemo AND Mighty Jack green with envy. The Nyctalope helped Severac battle a mad scientist named Oxus and his associates Fulbert the monk and Balsan the surgeon. The villains had created a hybrid shark-man called the Ichtaner, meant to be the start of an amphibious army. Needless to say our heroes emerged triumphant and the Ichtaner was returned to normal. In this debut appearance the Nyctalope’s secret identity was given as Jean de Sainte Clair, but de la Hire would absent-mindedly alternate between that and Leo Saint-Clair in future adventures before finally settling on the latter name. THE MYSTERY OF THE FIFTEEN (1911) aka THE NYCTALOPE ON MARS – Oxus the Mad returned as a villain in this first solo adventure of the Nyctalope. Oxus (renamed Arkhus in some later translations) was a member of a group called The Fifteen – a secret organization of megalomaniacal madmen. For a light-hearted Veterans Day post how about a Balladeer’s Blog shoutout to the fictional American World War One pilot code-named G8. 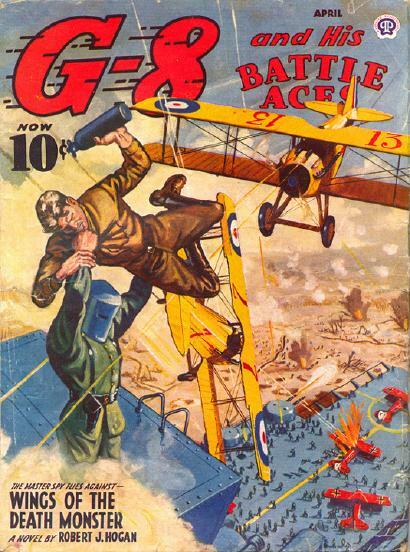 THE HERO: G-8 was the codename of an American flying ace of World War One. The character was created by Robert J Hogan in 1933 and over the next 11 years Hogan wrote 110 stories featuring the daring figure. G-8, whose real name was never revealed, was a master of disguise in addition to his piloting and hand-to-hand combat skills. Hogan’s hero (see what I did there) was unswervingly patriotic and fiercely dedicated to the defeat of the Central Powers. THIS IS IT! G-8’s FINAL BATTLE WITH STEEL MASK! Balladeer’s Blog concludes its look at the neglected Pulp Hero G-8. This has been a story-by- story look at the adventures of this World War One American fighter pilot who – along with his two wingmen the Battle Aces – took on various super-natural and super- scientific menaces thrown at the Allied Powers by the Central Powers of Germany, Austria- Hungary and the Ottoman Muslim Turks. G-8 was created by Robert J Hogan in 1933 when World War One was still being called simply the World War or the Great War. Over the next eleven years Hogan wrote 110 stories featuring the adventures of G-8, the street-smart pug Nippy Weston and the brawny giant Bull Martin, his two Battle Aces. Here are my reviews of the 109th and 110th issues of this massively underappreciated Pulp magazine. 109. 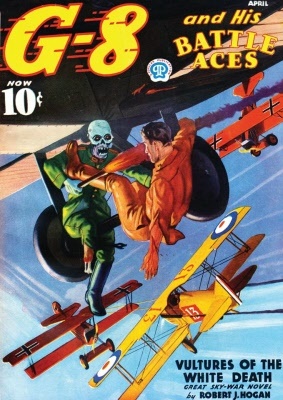 WINGS OF THE DEATH MONSTER (April 1944) – G-8’s FINAL BATTLE WITH STEEL MASK, the German supervillain who hid his disfigured face behind a metal mask decades before Dr Doom and Darth Vader came along. Just like our hero’s final encounter with his arch-enemy Doktor Krueger a few issues back this already exciting story gets an extra boost from pure nostalgia, marking as it does the last meeting between G-8 and his second-most memorable foe.